I have wanted to share my story for a very long time. I was born on April 27th 1993 and I have Down Syndrome. I have lived a very normal life with my parents and my brother Corey. I have been followed closely all my life for many health issues, including very high anxiety. I have a hypersensitivity to sound and touch and I am still trying to manage and cope with this. I hear sounds that others do not pick up in their hearing range and I am also very sensitive to people touching me. I can deeply feel other people’s feelings and emotions. It is about learning how to manage this gift, so that I may use it, but not be consumed by it. On August 24th 2008, I was diagnosed with Leukemia. The pain started in my legs and then traveled to my hip and then other parts of my body. My mom one day wanted to know exactly where the pain was in my legs. She touched every part of my legs to determine where the pain was, but I kept saying NO to her, that the pain was not in any of these parts of my legs. I told her she did not understand! This pain was deep in my bones! My mother then realized that a part of me knew and that I had given her a very important message that she was not prepared to hear! My treatments finished in December 2010. During this time, I received a great deal of support from family, teachers, friends whom I always considered my family! I was in the hospital for 9 months, in a wheelchair for 1 1/2 years, and had developed Diabetes. It took me several years to heal physically and emotionally and I am now trying to heal mentally. Thank you CHEO for giving me the GIFT OF LIFE ! I started school at 6 years old and have completed a four year special program in June 2018 at Algonquin College here in Ottawa, Ontario, Canada. During my years of schooling I have been recognized for my Gospel Value of Excellence, Hope, Compassion and Great Spirit. In 2014, I participated in a co-op program working for the friends of the Senate. I have had the most amazing teachers and assistant’s throughout my life. They definitely came from above to teach and help guide me down my path of growth as a person. I am truly Blessed! My mother told me that my Down Syndrome taught her to fully open her eyes, to see life through different eyes and live life one day at a time. My illness taught her to live in the moment and try to live life in Love, Peace and Joy, which I always have! I am a person who cares for people and will always try to help them with my touch (healing hands), my deep compassion, my words of wisdom and bravery. I came into this world very aware and connected to my 6th sense, intuition and knowing. I have had answers to things beyond my years all through my life, because my parents allowed me to be who I am. help his body with my touch. (healing hands) My brother and I have a very deep connection, which does not need words, but if I tried to describe it, it would simply be understood LOVE! My 1st wish was to go to Disneyland when I was sick. My dream came true in 2011, as I went to Disney with my family, with the help of Make A Wish Foundation! It was a wonderful trip! In December 2015, I was selected to the 2016 roster to attend Special Olympics 5 pin bowling in Guelph, Ontario, Canada. I was so excited as I had told my parents in the fall that my 2nd wish was to go to the Olympics. My dream came true in May, 2016! I had the time of my life. I had to overcome being on my own for 4 days. Away from home, I had to manage being on the bus for 7 hours, dealing with a CPAP machine. (I was recently diagnosed with Sleep Apnea) This experience helped me grow as a person and detach from my family and know that I would be OK! Our team won a Silver Medal! I asked my Mom after this event, what will I do next? 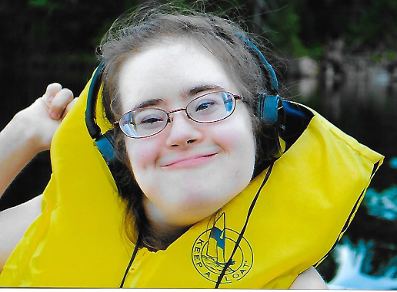 Camp Quality of Eastern Ontario is for children who have had life threatening illnesses. I have been very grateful to have attended this camp for the past several years. It is a place that is fun, safe and allowed me to heal my body, mind and soul, as the people volunteering care and share their love, which is what I needed to heal! My companions have been very Special women whom I love as family. This camp allowed me for one week a year to plug into something so special. It helped me to transition back to the real world which I no longer trusted and felt safe living in after my Cancer. When camp finished each year, I would begin to count down the time until I could possibly return the following year. There was nothing in my world that was more important and close to my heart as Camp Quality. It was my security blanket and I would not be the person I am today, had I not had this Camp in my life. The amazing people who make this camp possible with their gifts, talents, imagination, dedication, willingness to help other’s, caring, support, words of encouragement, inspiration but mostly and simply LOVE! Love truly does help us heal! My 3rd and 4th wish is to return to Disney via the Disney Cruise now that I am out of my wheelchair and can walk again. I would love to experience this trip healthy and whole! I also hope and wish that my story be selected. My aunt Marcy (Marcelle Billings) who’s story was selected in May 2016 gave me the courage to follow through on this longtime dream that was just waiting to be expressed. I know that the time is right for me and I want people to know who I AM! My current dream is to be able to sing along to Celine Dion’s song “My Heart Will Go On” to help families who have lost a child or pet. I am my Father’s Princess, my Mother’s Angel, my brother’s Inspiration and I have come to this world to bring Peace amongst people and show them that we need to Love each other, Let Go of our Anger and Hatred, so that we can live in a World of Love, Peace and Joy! I will forever wish and dream, as this is what helps me bring my gifts into my physical Reality!